Stephen Few has written a long and scathing piece tearing down a paper presented at VIS earlier this year. While some of his criticism is justified, it is too focused on one of the authors, and it comes from an idea of visualization research that is far too limited. The paper in question is Beyond Memorability: Visualization Recognition and Recall by Michelle A. Borkin, Zoya Bylinskii, Nam Wook Kim, Constance May Bainbridge, Chelsea S. Yeh, Daniel Borkin, Hanspeter Pfister, and Aude Oliva. There is a discussion thread that a number of visualization researchers have posted in to respond, including Jean-Daniel Fekete, Jeff Heer, and Ben Shneiderman. I therefore won’t attempt a detailed response here. Instead, I hope to illuminate the way visualization research works, and whether or not it is a science. Steve’s main concern is what he considers the lack of scientific rigor in the paper and the field in general. He complains about several issues with the paper, including the small number of study participants, the study mechanism of showing people images for a short time, etc. This is the part I won’t respond to in detail because it just gets too technical and has already been largely addressed by others. Instead, I will try to talk about research in visualization in a more general way. I suspect that her studies of memorability were dysfunctional because she lacked the experience and training required to do this type of research. I can see where he’s coming from. Michelle got her Ph.D. at a little place called Harvard. Do they teach the scientific method at Harvard? I don’t know. It’s only ranked second in the U.S. overall and third globally for both Computer Science and Physics. Though perhaps we could ask the dozens of Nobel Laureates that work there or came from there. The statement above is especially silly because Michelle’s Ph.D. is actually in Applied Physics, which in contrast to Computer Science is an actual science. It is also odd because Steve praised one of her papers in 2011. If that was a scientifically sound paper, has she forgotten the scientific method in the meantime? Has the exposure to all those infographics gotten to her? I know you wish to avoid this topic. But I am more concerned that people new to the field (especially women) will read this critique, see the pointed references to Borkin alone, and see it go largely unchallenged. Intended or not, our actions serve as examples of what is and is not acceptable conduct in the community. Criticism is clearly useful, and so is pointing out issues. But the tone and personal style of this are way over the line – even if Steve doesn’t consider the tone aggressive. I have argued in the past that visualization should be more scientific. But science, or the scientific method, is not the only criterion here. Visualization doesn’t work like a hard science – not even hard sciences work like that all the time. Even though most information visualization research is done in university departments with “science” in their names—predominantly “Computer Science”—most of the work is not done scientifically. Computer science is not a science in the classical sense. Computer “science” has a tortured history itself, coming out of the math departments of the 1960s, 70s, and 80s. Some parts of computer science work like math: algorithms, parts of database research, graph drawing, etc. As much as math is a science, that work would pass muster as well. But computer science, and visualization, are equally about engineering and making new things. You don’t push the boundaries by studying what is there, you invent and develop what isn’t. That’s not something a pure science does. Much of the work in visualization is therefore new ideas – what Steve calls “Software Development Studies.” They’re called technique papers in visualization, and the point is to propose new ways of doing things. Many of those now include more or less elaborate studies to show that they work or do something better than what exists. There is a big discussion on whether it should be possible to just propose new ideas without having evaluated them. If a few reasonably experienced people agree that it’s new and interesting, why not accept it for publication? Insisting on the scientific method gets in the way here. It can be more important to get interesting new ideas out to see if they take off than to reject a paper for minor issues. The result is a more lively and interesting field, instead of a boring and moribund club of the same people discussing the same old stuff. Visualization doesn’t even have the crazier stuff like the HCI (human-computer interaction) community has with alt.chi and other venues. But this sort of openness is important for a field to keep adapting and changing, especially a field so young. Now to be clear, this does not excuse poor research. But it means that papers that raise important questions are worthwhile, even if they aren’t perfect. Beyond Memorability is not perfect. So what? If you start digging around, you will find issues in almost any paper. This paper studies something that is very difficult to get a handle on and takes a good first stab. Others will build on that and improve it. That’s valuable. The greatest tragedy of this research is that what makes a visualization memorable is actually of no consequence. Visualizations don’t need to be designed for memorability— they need to be designed for comprehension. Yes, but those are separate issues! Comprehension is certainly important, but that doesn’t take away from the question of memorability. They can be studied independently. It would be pretty difficult to do both in the same study, actually. A study needs to be focused. Conditions need to be controlled. Difficulty is one of them: if you make it too easy, everybody answers everything and there’s nothing to learn. The choices made by Michelle and her colleagues are informed by these kinds of considerations. The types of questions and tasks done in a study can also look artificial. Again, that’s part of the need to control all possible factors that influence performance. If you don’t control them, you don’t know what caused differences. When you strap somebody into an eye tracker so they can’t move and only given them a single button to push, that’s not a realistic setup. But it helps to eliminate randomness from head movements, the hand not being close to the button, etc. But I’m getting off track. Back to memorability as a valid topic. For most visualizations, the comprehension that they provide need only last until the decision that it informs is made. By that logic, all visualizations are disposable: look at it once, make your decision, throw it away. That’s not even true for analysis, and it’s not true at all for presentation. We have plenty of people coming to Tapestry, for example, trying to find better ways to get information to people about their health, how to better manage their money, etc. They would benefit tremendously from their audience remembering the visualizations that tell them about their risks, the different kinds of foods they should eat and not eat, etc. Visual memory would help a lot more here than some one-time decision. Memory isn’t a set of shelves where we store pieces of data, like a computer. Our memories are highly connected and are triggered by pieces of information we can latch onto. Imagery helps with that, including both visualizations and potentially embellishments. This is well known, and we showed it pretty clearly in the ISOTYPE study. 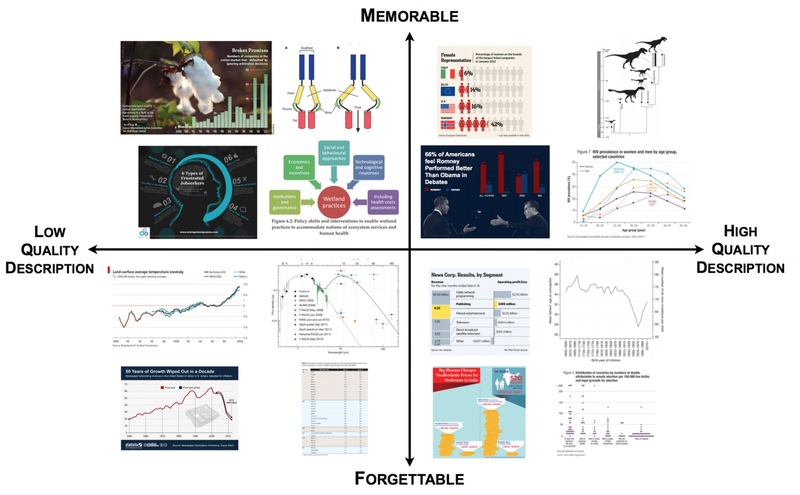 More images, more text, and more ways of connecting visualizations with what people already know will help them remember. It’s no secret where I stand on the question of storytelling and presentation in visualization. We made that pretty clear in a paper titled Storytelling: The Next Step for Visualization a few years ago. I also have a piece coming up in the Visualization Viewpoints column of the January/February issue of Computer Graphics and Applications where I’m trying to tease apart presentation and analysis a bit further. This sort of work has only recently started to make its way into the visualization literature. That is partly thanks to people like Michelle Borkin who have done trailblazing work in this area. Whether presentation should be a part of visualization is not a matter of science, it’s a question of what work is considered to fit. Information visualization has only been around for a short time, and the boundaries are not very clearly defined. Instead of insisting on particular arbitrary demarcation lines, why not let a thousand flowers bloom and see what happens? This isn’t about us; it’s about a fledgling field of study that is struggling to emerge from the nest. Let’s give it wings. Exactly. But I don’t think shooting the bird is the way to do that. Thank you for calling out that vitriol; it was uncalled for. That said, Harvard indeed does not generally teach the scientific method, in my experience. When I tutor people from Harvard or work with graduates, I have to teach it to them. It is a serious problem and has confounded the progression of public health science. I also call into question the visualizations presented in the article of their results. When one visualizes non-significant results as was done in Borkin et al., it confers the implication they are important for some reason. I had trouble seeing the “importance” of what was visualized – without a clearly stated hypothesis (or objective), it is not clear what the team found. In terms of a visualization, I remember Marshall McLuhan’s quote, “The medium is the message.” Simply making a visualization suggests that what is in the visualization is important, and the visualizations presented in this article (their bar graphs, and their HR graphs) suggest that these results are meaningful enough to deserve to be visualized. I respectfully disagree given the poor description of the study and questionable study design. This is unfortuantely typical in science, and singling out this particular article surprises me. I would say about 80% of the articles I read go something like this. Results of unclearly described, poorly-designed studies are overinterpreted by unnecessarily large lists of scientific authors and somehow published in the peer-reviewed literature. Harvard authors get a free pass from other reviewers, but I don’t give them one. With all, I insist on clarity and clear communication that speaks to multiple disciplines about what the point was of the article. I’m a Charles Hennekens fan. What did you seek to find? Did you find it? This article does not answer either of these questions with their text or visualizations, and their results are therefore not actionable. I like Stephen Few. A very much like how he’s not afraid to challenge what’s commonly accepted. At the same time, I too felt his most recent newsletter read like a diatribe against one researcher more than it did a critique of current research in data visualization. I’ll grant the paper my Borken et al could have done certain things differently or better, I suppose. I’m simply acknowledging that concern because others have said it though I have no specific suggestions. To me, that they could have done this or that better is not all that important, and in reality it can be said of all research. What’s more important is that the researchers in this case sent their work in for peer review through a time-tested albeit admittedly imperfect system of scientific review. And though we can argue about whether this research should have passed review, we can all hopefully agree the researchers in this case participated in the traditional scientific process of having their work vetted by experts and peers. I bring this up because Few has NOT done any of this. His critique of the research was not sent anywhere for a double-blind review. He did not receive expert advice on what might make his work better. He did not have to address challenges from reviewers. In other words: he did not submit his own work for scientific scrutiny. That’s important. Because to the extent he is challenging others to more rigorously follow the scientific method, he should open himself up to the same type of scrutiny to which the researchers opened themselves. I’m not saying he doesn’t open himself up to scrutiny personally. He regularly invites lively debate of his work. But his critique is not on the same playing field as a critique that would have gone through a double-blind review process and was subsequently published by the same journal. Bottom line: I don’t think it’s fair to accuse your opponent of a lack of traditional scientific rigor when your response circumvents the traditional process of scientific scrutiny. Calling research out in a newsletter is not an example of scientific critique. Lots of points I agree with here (that is probably not a surprise :-). But I’m not sure its fair to say that Few singles out women if you look at his critiques overall. He’s done the same to multiple male-first-authored works. Monika, if I’m understanding you correctly, I think that’s a misread of McLuhan. In fact, what McLuhan suggests is that the artifact (i.e., the visualization medium) is worth studying independent of the content which it conveys, as it has influence (the message of the medium as distinct from the content communicated over the medium)*. Visualizations of this type exist, and will continue to exist. Saying that they should not, will not make them vanish. Given that they do exist, isn’t it appropriate to study their effects, why people make them, and why their designers have adopted certain strategies? (good and bad). Few’s position, as far as I can tell, is that all such visualization are (capital-b) Bad (for his business? for the world? I don’t know), all research that implies otherwise must be wrong, and any academic discipline that would allow the existence of such work to be corrupt. Once committed to that initial “this type of infovis is Bad” position, it becomes impossible to understand the study for what it is. Thus we have the meaning of “the medium is the message:” We can know the nature and characteristics of anything we conceive or create (medium) by virtue of the changes – often unnoticed and non-obvious changes – that they effect (message.) McLuhan warns us that we are often distracted by the content of a medium (which, in almost all cases, is another distinct medium in itself.) He writes, “it is only too typical that the “content” of any medium blinds us to the character of the medium.” (McLuhan 9) And it is the character of the medium that is its potency or effect – its message. Being a long time fan and follower of both you and Stephen, I have to say, I see an awful lot of strawman arguments here, and a lot of emotional, in-substantive response. I also see a completely ludicrous and uncalled for claim that Stephen singles out women in his critiques – you start by saying that Stephen’s tone crossed the line. Your completely untrue accusation that Stephen is attacking women crossed the line, Robert. I think you’re better than that. I also see a great deal, in this article and many other responses, of what can only be called tone policing. Yes, Stephen’s critiques and even his every day conversation can come across as harsh. His style is frank, direct, and sometimes lacking in sensitivity. But I don’t see anything in his critique or in his responses to it that is emotional, personal, or vitriolic. Stephen writes in a style that will alienate some people, and it would benefit him to recognize this. But let’s focus on the actual critique and its content, rather than on his perceived tone.